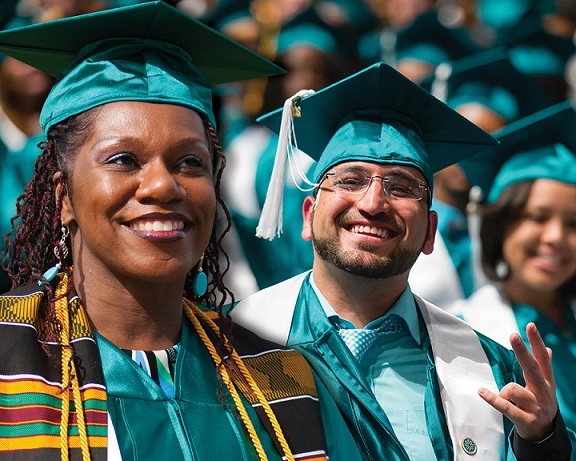 Save the Date: Spring 2019 Commencement is Thursday, May 16, 2018 at 6:00 p.m. at the Wolstein Center at Cleveland State University. All faculty are encouraged to volunteer or march in the processional for the upcoming Commencement ceremony. As a reminder, marching in the Commencement processional or volunteering may qualify as a mandatory day or one service credit. Check with your associate dean for details. Adjunct faculty are also encouraged to march or volunteer. Note: Commencement is not eligible towards the Adjunct Stipend Program. Full or partial regalia may be rented through the campus bookstores. Click here for an order form and additional information. For pricing, please reach out to your campus bookstore—some sale pricing may be available. Payment is due in full at time of order and all orders are final. Deadline for orders is April 8, 2019. A $10.00 late fee will be charged on orders placed April 8 – May 3, 2019. A $10.00 late fee and $25.00 overnight handling fee will apply on all orders after May 3, 2019. Final date for ordering to receive regalia for graduation is May 9, 2019. All orders placed by April 8 will be available for pickup in the bookstores after May 8. If you have any questions regarding regalia, rentals or ordering regalia, please contact your campus bookstore. One complimentary parking pass and a map will be available at each campus Student Life Office beginning Monday, April 22, 2019 for anyone who has registered. Please note: Those without the Tri-C complimentary parking pass will be required to pay standard rates. On the day of Commencement, faculty registered to march in the processional should arrive and report to the fourth floor of the Wolstein Center Conference Pavilion by 4:30 p.m. where you will robe and assemble for the processional. The deadline for faculty to register in TEC to march in the Commencement processional is May 10, 2019. Registration is required in the Talent Engagement Center (TEC) by following these steps. For registration questions, contact Jessica Miller at 216-987-5027 or Jessica.Miller2@tri-c.edu. If you would like to volunteer instead of marching in the processional, click here to complete the volunteer form. For questions, please contact Jessica Miller at 216-987-5027 or Jessica.Miller2@tri-c.edu. Do you know a student who has a great story to tell about their road to success here at Tri-C? Let Integrated Communications tell that story. Just fill out the few questions on this form and they will do all the work to get it. Thank you for your participation and your continued support of student success!